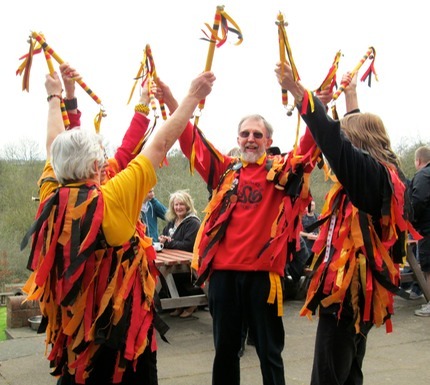 North West Morris in the Midlands! Black Adder - 30 years of fun. Join us! Black Adder are a mixed gender, all ages, side based at the Friends Meeting house in Selly Oak, Birmingham. Our dances are mostly original and based on the North West tradition. We dance with short sticks, long sticks, or no sticks. 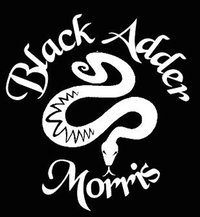 Black Adder welcomes new dancers and also people who would just like to give it try to see if they like it. Experience is not required, but enthusiasm is! Our musicians play a variety of different instruments as accompaniment to the dominant sound of the English Border pipes. We welcome new musicians who would like to join the band. We have a "cool, new, groovy" facebook group (well, that's what our AGM minutes say). For the most up to date information please refer to that. (There is a "Facebook Group" link in the banner at the top of this page: You don't need a facebook account to access our facebook group). The pages on this web site contain archive information; they probably won't be updated frequently.